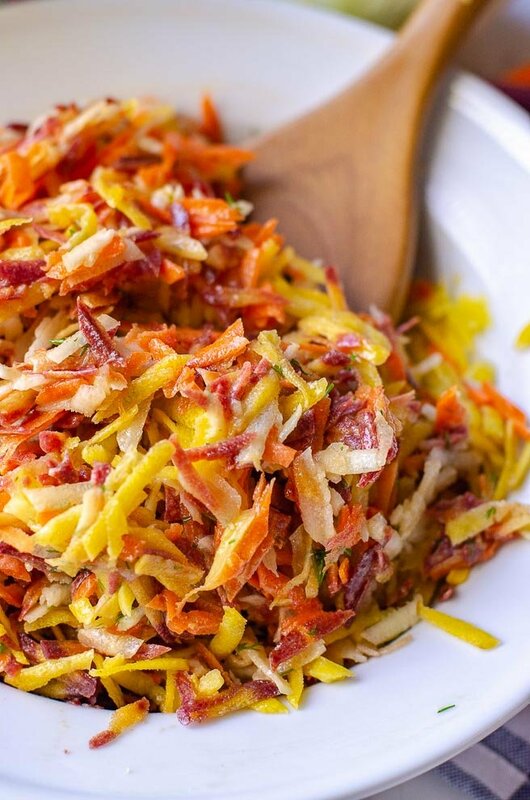 This crunchy, light, and colorful carrot salad is wonderful in every season. It makes a perfect dinnertime side dish or super easy lunch. Note: This recipe was updated with new content on January 14, 2019. My favorite thing about this carrot salad is how pretty it is. Those rainbow carrots are really given the opportunity to shine. Plus, the fennel flavor isn’t too strong. So it is an excellent way to usher in the beginning flavors of spring, or enjoy in the winter. The important thing when preparing this carrot salad is to grate the carrots on the largest grater setting. If you use the smaller setting, the texture will feel a bit mushy. If you have narrow carrots, small chunks may fleck off or fly away as you are grating. Don’t stress it though, the further up the carrot you get, the easier it will become to grate. You can also use a food processor, mandolin, or KitchenAid attachment to help grate the raw carrots. As long as you have a sharp grater at hand, this carrot salad recipe is easy. There are so many wonderful ways you can improve upon it though. These tips will help you make this carrot salad even better. Make A Perfect Vinaigrette. This carrot salad recipe uses a dijon-dill vinaigrette. This article explains emulsification and the process of making a perfect vinaigrette. How To Buy & Store Fresh Herbs. Dill is a hearty herb while it is growing, but is very fragile once picked. Find out how to pick it out and keep it fresh. Can Carrot Salad Be Made Ahead? 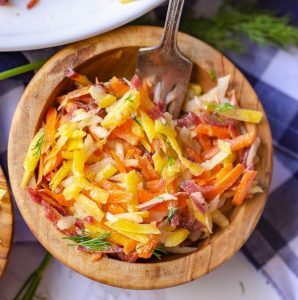 Since neither carrots or fennel have an exceptionally high amount of water, this carrot salad recipe is easy to make ahead. For the best results, store the vinaigrette and salad separately until serving time. This will let you recover the vinaigrette if it separates before it is time to eat. The only thing to consider with this carrot salad is that the color in the rainbow carrots may bleed. While not a big deal, it could potentially discolor the white carrots or fennel. Delaying dressing the salad with the vinaigrette will help with this also. The lack of fluid to push around or trap the bleeding color will help keep your salad looking fresh. If kept in the refrigerator, this carrot salad recipe can be made up to three days ahead. Both the carrot salad and the vinaigrette will stay fresh in the refrigerator for up to three days. After that the carrots begin to lose their crunch and the dill will wilt. Store them in an airtight container for best results. Since this salad has such a large amount of dijon in it, this salad dressing should stay emulsified better than others. However, you should still expect to see some separation overnight. If this happens you can shake it in the container for a few minutes until it is reincorporated. You can also mix two tablespoons of the vinaigrette with extra dijon mustard and whisk the vinaigrette into the fresh mustard. It will be like you’re making the vinaigrette all over again, but it will be better combined. Carrots are so good in any season that this carrot salad recipe works for any number of events. I’ve taken it as a side dish to a potluck Christmas. It is also great for cookouts because it is delicious served cold or at room temperature. Plus, it doesn’t wilt if it is warm outside. Since carrots and fennel both come into season in autumn, this is also a terrific side dish for Thanksgiving. As I talked about in my 12 tips for a killer salad, any salad is made better by having varying textures. It’s part of why the carrot salad with raisins became so popular. If you want to add some varying texture, I recommend segmented orange slices or some slivered almonds. 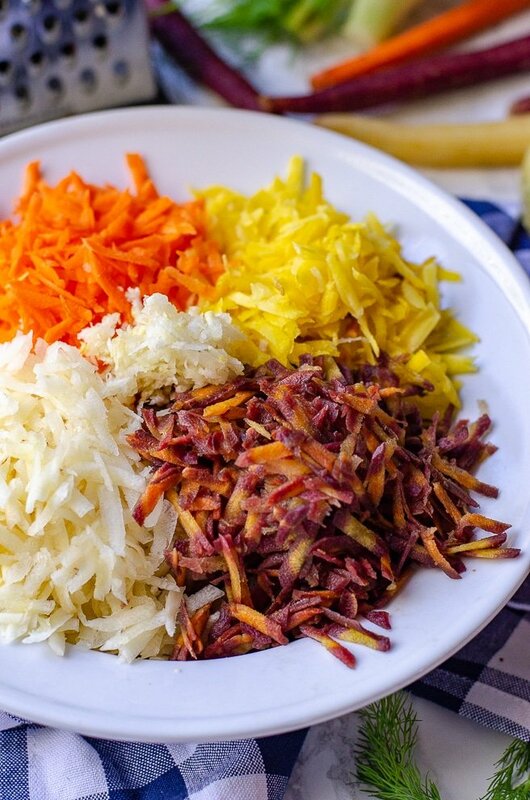 Want a free printable grocery list for this rainbow carrot salad recipe? Get it HERE. 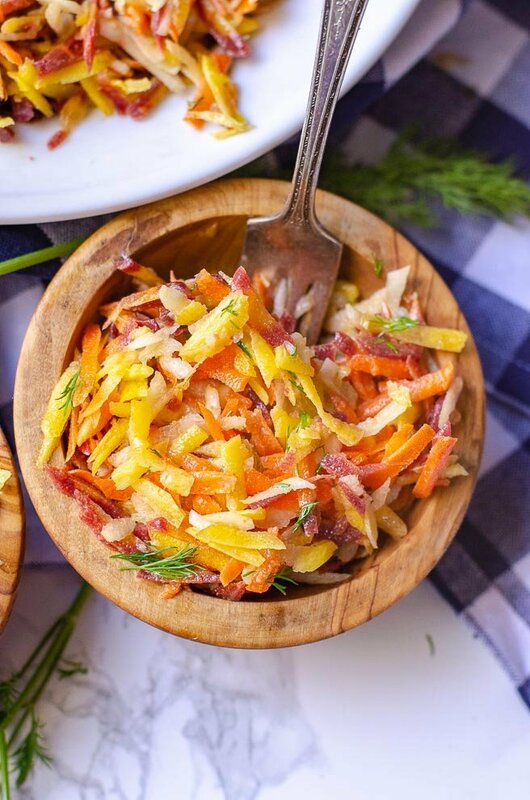 The beautiful color and fantastic crunch of this rainbow carrot salad makes it a stunning side dish at any meal or cookout. Using the largest grater setting, carefully grate the carrots and fennel into a large bowl. Set aside. In a small bowl, combine the white wine vinegar, dijon mustard, and garlic. While whisking vigorously, slowly pour your oil of choice in a thin and steady stream into your vinegar mixture. Once the vinaigrette is emulsified and complete mixed, use a fork to gently stir in the dil. Season with salt and pepper. Toss the vinaigrette with the grated carrots and fennel. Serve. If you choose to use storebought shredded carrots, you may notice that the salad is a bit drier than fresh carrots. Adding extra salad dressing won't fix it, it will just make the carrot salad feel greasy. What a fantastic salad. You are in Spring and we are in Autumn here in Aus. I think it is just as perfect for our weather right now too. I hope you get to try it, Sara. Thanks for stopping by! Such a beautiful looking salad! I am also loving your recipe plugin! How fantastic is that, I wonder what it is…! Fabulous side dish, I love fennel, in fact anything with an aniseed kick to it and I am a happy bunny. I’m usually the opposite, Brian. I’m not a huge anise fan, but the fennel we’ve been getting here recently is so perfectly sweet that I’ve been eating it every day! I’m have been on a lettuce free salad with vinaigrette kick lately and this would fit right in. Off to check out that recipe plug in too! Simple and healthy salad. Live to try any veg salad 🙂 looks delicious! This is such a spring salad and looks perfect. You made such a great vinaigrette to go with it – I’m sure it tastes delicious! It really does! I hope you get to try it sometime, Molly. Ooh! Sweet spring fennel is such a treat. What a lovely salad idea; the flavors must pair so well with the Dijon vinaigrette! What a thorough post! I love that you give instructions on storing it and making it ahead. Love the colors in the salad. Looks delicious! Isn’t it so beautiful? The rainbow carrots really give it that visual “oomph”. Not only is this a gorgeous salad, it’s healthy and the flavour combination looks just delicious! We are on the healthy eating bandwagon at the moment. This sounds like the perfect dinner salad. Lots of great texture and flavours happening here. Love the fennel. Adds such a great flavour. This is such a great side dish! It is just a little bit naturally sweet from the carrots and goes so well with a good baked chicken. Love a good salad and this one has so many delicious flavours and colours! YUM! I love how pretty (and easy) this recipe is! This sounds super duper refreshing and crunchy! I could definitely gobble this up as a side dish on its own, but I’m also loving the idea of piling this onto a sandwich of some sort. My husband does pulled pork every once in a while and makes a side of vinegary slaw for people who want it as a topper. I might have to replace his slaw with this next time! That’s a great idea! This would be fantastic on a pulled pork sandwich. Especially with with a Carolina-style bbq sauce. The vinegar flavor of this isn’t as strong as most slaws, but the sweetness would balance a vinegary bbq sauce well! We absolutely love a good carrot salad and this looks divine. The vinaigrette is perfect. I love the suggestion of adding a little variety, such as raisins and almonds. I have added a little curry, too, and loved it. This carrot salad not only looks delicious, it’s gorgeous in appearance, too. Very excited to make this recipe. Thanks for the great recipe and inspiration! This is gorgeous!!! And I absolutely LOVE fennel – it’s one of my favorite vegetables but I don’t eat it enough. Great tips in the vinaigrette – thank you! What great colors! It’s so nice that we’ve rediscovered multicolored carrots since they make our meals much prettier. And I love the combo of the dill with the carrots – I think those flavors go so well together. I’ll have to try this with the slivered almonds idea for a little extra crunch to the salad. I love the slivered almonds with it because it keeps the same shape as the raw carrots and blends in nicely. What a gorgeous salad! And I love the versatility of which season it fits best with. This would be a perfect crunchy side dish for one of our next dinners at home! Yes! I love how the carrot salad morphs to fit the entree you’re serving it with. It can taste bright and light with a spring entree, or feel festive and autumnal at Thanksgiving. Yes! My eldest daughter loves to take it in her school lunch and doesn’t complain at all when we have it again for dinner! It’s a beautiful, delightful recipe and it looks like it comes together in a snap (which is always nice!). I think that it’s a botanically interesting recipe too – carrots, fennel, and dill are all members of the same family, and it’s fascinating to me how well their very different flavours all come together here. I always love your insight and the way you look at food, Sean. I wish I had more of a botanical background to consider these kinds of things! Beautiful carrot salad. What a great idea to use multi-colored carrots for the salad. We do eat with our eyes and I would want to dig in right away. Like the dressing too – light and flavorful. Wonderful recipe. This is a great salad for so many reasons. I like that prep can be done in advance. I love how nutritious this is, including different colors with different nutritional profiles. The dressing sounds delish too. YUM. Yes! I love how easy this carrot salad is to prepare ahead! Makes it so useful for cookouts or expediting dinner! Wow, all the colors of the rainbow in this salad! I love how winter produce gives us such gorgeous pops of color. Like it knows that we need it LOL! I’m kind of obsessing over that dijon dill dressing. This is a must make! I love the thought of winter giving us those pops of color. You’re so very right! I hope you love the carrot salad! 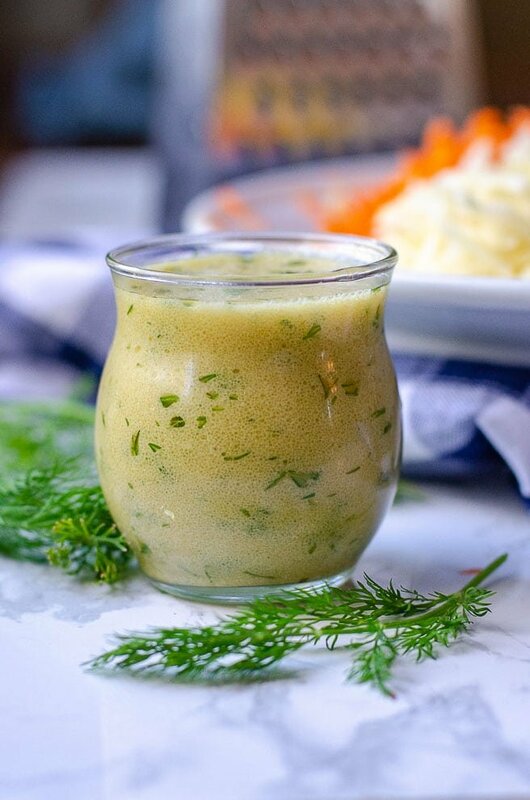 A Dijon vinaigrette is one of my favorites–especially with the addition of fresh herbs like dill. The rainbow carrots are so fresh and colorful, it makes me wonder why I don’t serve a simple carrot salad like this more often. I always think of overcomplicated salads as well. This simple carrot salad though is such a quick and easy recipe to throw together.